Director Channel Sales Based in the Mid-Atlantic Region, Harry joined Man & Machine in 2011, successfully managing channel partners in the positioning washable keyboards & mice for infection control. With over 25 years of experience in Infection Control, Operating Room procedures, Dialysis and Information Technology, Harry uses his experiences to bridge the gap between the Infection Control teams and IT within various hospital systems. Harry spends his down time coaching soccer and spending quality time with his four children. A new pilot study exposes a gap between the clinical workstations and the patients bedside in the ICU. These areas are outside the routine cleaning zones and have been found to have 7 times the levels of illness causing microorganisms. These gap areas include keyboards and mice which have been found to be significant contributors to high levels of microorganism when not part of a routine room cleaning. A point not mentioned in the study would be the possible cause of this dilemma could be lack of knowledge of a viable option and clear direction on how to address these hard to clean areas. Perhaps the question should be, how should keyboards be disinfected and with what? The solution is Man & Machine true Medical Grade ™ keyboards and mice. Our keyboards help bridge these gaps by allowing for proper routine disinfection and allowing for terminal cleaning when required. 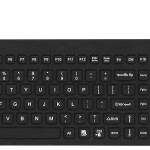 In critical clinical areas the Man & Machine Sealed, Medical Grade ™ keyboards should be part of every facility’s Environmental Hygiene program especially in critical clinical areas.